Every soon-to-be expat with pet needs to make one of the most difficult decisions before starting the journey. Should I leave my beloved pet with friends or family back home or expose them to the stress and horrors of a plane ride without knowing, if they will make it out the plane alive? My wife and I could not leave our two pet rabbits behind back in 2005 and so they became expats, just like us. Good news first: They made it across the pond alive and spent the rest of their days with us in our new home in North Carolina. However, there were a million questions that we had before the journey began 8 years ago, always worrying for our ‘babies’. Here’s a few tips that I have for fellow expats, who are inseparable with their pets. What animals are permitted to enter the US? First step would be to find out if the United States even permit immigration for your type of pet. Visit the website of the United States Department of Agriculture (Animal and Plant Health Inspection Service). Here you’ll find information whether your pet is permitted to enter the U.S. or has to stay in quarantine for a certain amount of time after immigration. It’s also a good idea to check with your particular state legislature to be sure that your pet will be able to enter the US. They are very careful about certain animals, because they don’t want any diseases like the avian flu to spread on US territory. In our case, rodents were permitted and did not have to stay in quarantine after getting off the plane, so we were reunited shortly after landing. Next important step is to find out what kind of vaccines your pet needs in order to get permission to enter the US. Therefore check out the PDF “Bringing Pets and Wildlife into the United States” to find out about the requirements, if any. Dogs for example will most likely need a rabies shot at least 30 days prior to entering the US, so make sure you do your homework way in advance to not miss any deadlines. Rodents currently don’t need any vaccines, but we wanted to play it safe and had them checked out by a vet to receive a vetenerian health certificate as well as a rabies shot. We did not want to take any chances whatsoever, because people at the border control might make mistakes and refuse your pets or give you a hard time if any questions come up. Call the airline you are planning to fly with and check, if they even transport animals. 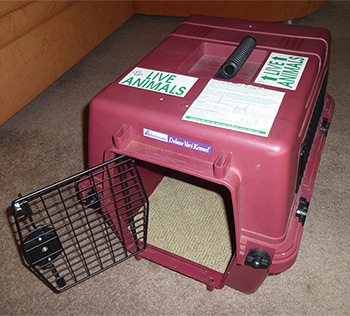 Owners of cats and small dogs may be lucky and can bring them into the cabin, if they are in a locked carrier. This way you will always be able to check on them and calm them down during the flight. Unfortunately we weren’t that lucky with our rabbits, since rodents love to bite through cables and are therefore not allowed in the passenger cabin. They need to go into a special cargo cabin, which is pressurized and temperature controlled to make it as pleasant as possible for animals to survive the flight. However, there’s not a lot of information about these cargo cabins, but I assume it’s loud, especially if there are lots of dogs who are barking all the time. No matter how good the airline is with animals, it’ll be a very stressful experience for any animal and you have to make that judgement call, whether your pet will be able to handle the stress or not. Cats and dogs for example should be fully weaned and at least 8 weeks old before stepping on a plane. Very old pets should also be spared from this stressful experience as they might not survive it. If everything looks good and there’s no reason why your pet should not immigrate to America, you need to buy proper transportation for them. Regular carriers might not be the best idea, especially if they will be transported in the cargo cabin. Therefore I suggest to buy a carrier made with sturdy plastic and good locks to assure that it doesn’t get damaged or accidentally opens up while the airport staff is loading and unloading the plane. Here’s a great list of carrier requirements for different airlines, if you’re planning to take your pet to the passenger cabin. You will also have to write your pets information on the carrier, which includes the pets name, your name and full address, destination, etc. You should also write LIVE ANIMAL on the carrier in big letters. It might already come with a sticker for that, so use it if you get one. Take a picture of your pet and tape it on the carrier as well. The carrier should be small enough to fit under the seat, if you can bring it to the cabin. However, make sure that your pet can stand and lie down it it as well as turn around easily. You don’t want to make this torturous just to save a few bucks. Put in something comfortable like a towel on a piece of carpet. A towel alone will probably move around and your pet might slip and hurt itself. You’ll also need something in it to catch any urine or poop, because you won’t be able to let them out of the carrier for obvious reasons. There can be food in the carrier, but most of all make sure they have a water bottle to sip on. It will most likely leak, so put enough carpet, towels or newspapers to catch any water or urine. 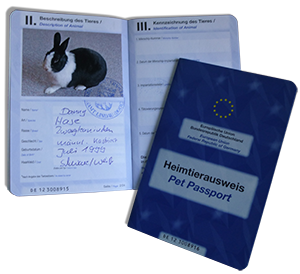 For our bunnies we got a pet passport, that had information about the breed, age and vaccines in it. We also had to take a passport photo of them and I was very tempted to take a headshot, just like in my passport. That would have been too funny! Unfortunately it is required to take a full body shot to include in the passport, so that’s what we ended up doing. On flight day, make sure to keep your pets active up until the time when they have to get into the carrier. If you have a dog you will be able to let them out at the airport for some more exercise. It might work with cats too in a closed area, but with our bunnies it was rather difficult. They would have been too afraid to hop around, so we left them in their carrier. Before you can go through check-in, you will have to check-in your pets at a separate counter for additional luggage. Don’t be shocked when you see that the airport staff will put the pet carrier on the conveyor. They will make sure to take them off before it gets too rough of a ride. At least that’s what they assured us. That’s pretty much all you can do for your pets. Some people give their pets sedatives to calm them down, but other vets say it can have the opposite effect of increased alertness. We decided not to give them anything, because they shared a big carrier and would hopefully calm each other down or just cuddle during the whole flight. Long story short, both of our bunnies made it out alive and we were extremely happy and relieved that they seemed to do okay. One last tip is about what happens after your arrival. You might not have a house or an apartment lease yet on your first day, so you’re probably staying in a hotel. Please call in advance and ask if they accept pets in the room. It’s not always possible to just sneak in animals without the hotel staff noticing it. Easiest would be to just get a room in a motel with exterior doors, so nobody would even care what you bring into your room. In our case, we were able to sign a lease for an apartment in advance, because my wife’s boss was so kind to co-sign the contract for us, assuring the landlord that he’ll pay the rent in case we would fail to do so. That’s why our two bunnies could stay their first night on American soil in our own apartment. You should also make sure the landlord is fine with having pets in the apartment. You see, there’s lots of research to do and errands to make, if you want your pets to accompany you on your expat adventure. 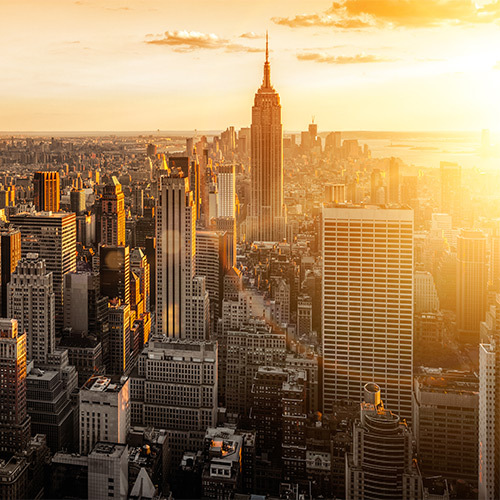 But once it’s all done, the family is reunited in America and your journey is up to a great start with little to no regrets.